Bus transportation is provided by All-Star Transportation, which operates more than 50 buses to transport children to our schools. Bus runs are done in two waves. The early runs serve New Milford High School and Schaghticoke Middle School. The later runs serve Sarah Noble Intermediate School and the elementary schools. 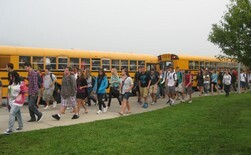 Transportation is also provided to other schools attended by New Milford children.